Most of us are familiar with this classic holiday song, but have you ever been on a real sleigh ride? My family had the opportunity to take a sleigh ride with Rocky Mountain Outfitters on a winter trip to Midway, Utah last year and it was a lot of fun. Rocky Mountain Outfitters offers horse-drawn sleigh and wagon rides throughout the winter at Homestead Resort in Midway, Utah. 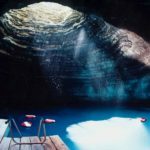 Midway is arguably the most charming small town in Utah, and Homestead Resort has done it’s part to establish that reputation since 1886. Together, they are an excellent family destination, and are a popular romantic destination as well. Midway is located in Heber Valley, about 20 minutes drive from Park City and 40 minutes from Salt Lake City. We met our guide in the outfitter shop near the back of Homestead Resort about 15 minutes before our scheduled private sleigh ride. Our guide was friendly and was happy to introduce us to his horses, answer questions and take photos for us before our ride. Rocky Mountain Outfitters has wagons and sleighs in several sizes to accommodate private groups large and small. Our wagon had space, and some to spare, for the four of us to ride together, facing each other. Our guide was a local and he narrated our tour of Homestead Resort, which lasted about 30 minutes. He shared interesting facts about the resort and the community and easy to engage in pleasant conversation. During our visit, February temperatures were unseasonably warm and there was no snow on the ground. Rocky Mountain Outfitters uses horse-drawn wagons or carriages when the weather isn’t snowy enough for sleigh runners. It was still a fun and unique experience, and the mild winter temperatures meant that we didn’t need to bundle up so much. Sleigh rides are scheduled in the afternoon and evening, so it was a lovely way to finish our action packed day in Heber Valley. We had already been snow tubing at Soldier Hollow and swimming in the indoor pool at Zermatt Resort across the street. Other fun family activities in Heber Valley include swimming in the Homestead Crater, which we saw again during our sleigh ride, taking a ride on the historic Heber Valley Railroad or ice skating on Midway’s outdoor skating rink. Rocky Mountain Outfitters offers several guided winter activities, and they will be happy to fill any gaps in your itinerary with snowmobile tours, winter horseback riding or fly fishing. Sleigh rides to the “North Pole” are available between Thanksgiving and Christmas, and include time to visit with Santa in his home. Santa Sleigh Rides can accommodate up to 15 people and are group rides, not private rides. These rides may fill quickly, so be sure to make reservations in advance. 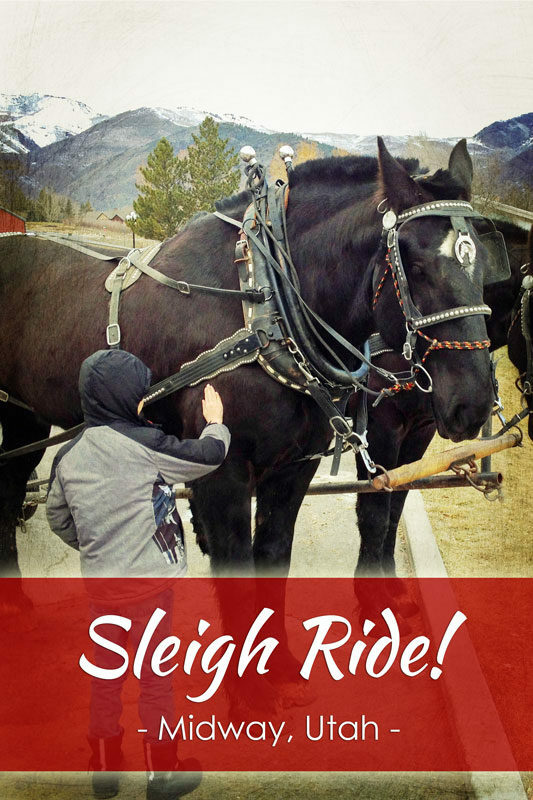 Learn more about Santa Sleigh Rides at www.rockymtnoutfitters.com/Santa-Sleigh-Ride. Disclosure: Our ride was complimentary for the purpose of review. As always, all opinions are my own. Where: Homestead Resort, 700 North Homestead Drive, Midway, Utah. When: 3:15-8:30 p.m. most days from late November through early April, weather permitting. Make reservations online or at 435-654-1655. Santa Sleigh Rides: $32.95 per adult. $14.95 per child (age 4-12.) Ages 3 and under are free. Private Sleigh Rides: start at $25 per person. See Rocky Mountain Outfitters website for details. Don’t forget to tip your guide. How Long: About one hour. The ride itself is about 30 minutes, give or take. Arrive 15 minutes early to check in and sign waivers. Amenities: The Homestead Resort has an on-site restaurant, restrooms and free parking. The Homestead Crater is also on the property. Planning a trip to Heber Valley? I LOVE to read your posts.just discover your site from somewhere. great sharing your story & experiences. i will recommend this site to my friends out there. I’m actually jealous of the snow you’re getting – over here in Indiana we’ve only gotten like an inch of snow like 3 weeks ago, and haven’t gotten any since! It’s pretty crazy. But I’m sure we’ll end up getting more than enough once January and February roll around. We’ve had a great snow year so far! Six more inches on my front lawn today. Here’s hoping that winter finds you soon. I will bookmark your site !